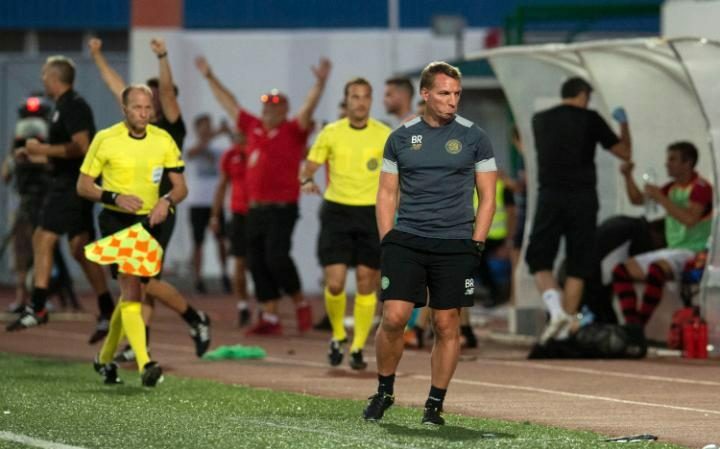 Celtic manager Brendan Rodgers claimed that there is no embarrassment to take from his side’s 1-0 Champions League qualifier defeat to part-time Gilbraltar club Lincoln Red Imps, as he said that “football isn’t about winning, it’s about taking part”. Renegade cop Lee Casciaro scored the winning goal for Impscoln Red Lin three minutes into the second half, defying the vast contrast in wealth that meant that Casciaro was forced to legally change his name as his club couldn’t afford to print Cascarino on the back of his shirt. As well as being a police officer on the wrong side of the law and a loose cannon, Casciaro’s teammates for the tiny little Rimps include a part-time carbuncle lancer, a member of the band 3 Of A Kind and an unconscious Irish priest in a remote control wheelchair being piloted by manager Julio Cesar Ribas using fake hands. It made for a nightmare debut for ex-Liverpool and Swansea boss Rodgers, appointed as manager in May with the objective of overhauling a bloated and underperforming squad who, according to a club insider, had become “so clueless they attended mass every Monday to worship Jack Stein”. Captain Scott Brown was reported to be “more confused that usual” after the game. That will do little to appease Celtic’s passionate fanbase, hundreds of whom travelled to the tiny principality – despite the risk posed by the nearby anti-Ronaldo revolution occurring in Portugal which has resulted in the use of nuclear weapons – as they were forced to watch their side lose to a team so small that their club gift shop is a photograph of a Poundland branch in Halifax taped to the door of a coal shed. Pitchside reporter Dale Carnoustie noted the dark mood on the Celtic bench, stating: “They were all halfway to greeting, like, and big Stevie Woods was clocking Brodge like he was wanting to burst him right there and there, like. “Moussa Dembele was fannying about all game, and there was folk proper giving him a go and that for it, proper Jimmy Saville shite, eh? So Brodge goes and takes him off for Ciftci then all those cunts are proper grimacing like a girl in DP, cause they’re suddenly kenning he’s shite and all”. The Redimps Lin Coln faithful were, by contrast, witness to the biggest win in the club’s history, one which chairman Derek Alman claims overshadows their previous most celebrated achievement, when they carried out the successful heist of their all-seater stand from Arsenal’s old Highbury stadium. After Cristiano Ronaldo won EURO 2016 against the imperialist French and Leicester City secured the Premier League title despite averaging just 3% of possession in their games, the Colnin Rim Pes continue 2016’s trend of the underdog embarrassing the overdog, despite Rodgers’ semantics.